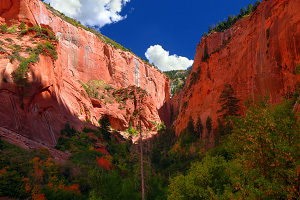 The Taylor Creek Trail is one of the few official and popular trails in the Kolob Canyons section: a pleasant 5-mile (roundtrip) hike up one of the enchanting "finger" canyons. The Taylor Creek Trailhead is well marked and easy to spot; it's a prominent parking lot on the left (north) side of the road a little over 2 miles from the Kolob Canyons entrance. This hike is fairly easy and children-friendly and should take roughly 3 to 5 hours to complete. Note: This trail is also commonly known as "the Middle Fork of Taylor Creek." Rating: Fairly easy day hike. Elevation Change: Gradual 500-ft ascent up the canyon. Starting from the parking lot, the trail makes its way down to Taylor Creek and then heads upstream. The maintained trail stays on the banks close to the water and often crosses the streambed. (The Middle Fork of Taylor Creek usually has very light flow, so your feet shouldn't typically get very wet, although flow can be higher during the spring runoff.) While the hike is fairly easy and level, there are plenty of spots where you will be hiking up and down the banks of the creek and hiking over or around large boulders. Along the trail you will encounter two historical cabins. The first is the Larson Cabin (located on the north side of the stream near the confluence of the North Fork of Taylor Creek) and the second is the Fife Cabin (located about half a mile upstream in the Middle Fork). These historical cabins were built in the 1930's before the Kolob section was added to Zion National Park in 1956. Almost a mile from the trailhead, the scenery gets more interesting as we make our way into the actual narrow "finger" canyon (past Tucupit Point to the north and Paria Point to the south). In the afternoon sunlight, the sandstone glows a magical orange and pink. 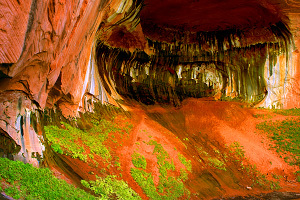 The maintained trail ends at the highlight of the canyon: the Double Arch Alcove -- an extremely photogenic cave-like formation where the sandstone is undercut and water seeps through coloring the rock with black and white lines. Enjoy the ambience, then hike back out. Note: You can hike further up the canyon, but just around the corner from the Double Arch Alcove is a very steep landslide with many loose boulders that could accidentally be knocked down on co-hikers. Most people would turn around at this point, but above the landslide is a beautiful little section of near the head of the canyon. Unfortunately, the overgrown vegetation makes for miserable hiking with a lot of bushwhacking to get to a spot where the canyon narrows and the rock formations prevent further travel. Turn around when you have had your fill. Map for Middle Fork, North Fork, and South Fork. This is a good family-friendly hike that will familiarize you with the Kolob Finger Canyons. It's admittedly a bit overgrown and not extremely photogenic, but it's still a fun hike. The double-arch alcove is a magical Zion landmark and is well-worth the effort.